Frictional, spring, and gravitational forces act on as block as it slides on an inclined plane. where k is the spring constant in N/m, μk is the kinetic (sliding) coefficient of friction, θ is the angle of the incline, and g is the acceleration of gravity in m/s^2. We use the + sign when the block is moving to the right and - sign when the block is moving to the left. Note that the model uses a unit mass block and a natural spring length of L/2 in order to limit the number of input parameters. where the normal force N is that component of the gravitational force that presses the block into the plane. The static coefficient of friction is harder to quantify than the kinetic coefficient but is generally larger than the kinetic coefficient and may arise from surface irregularities and surface contaminants. The Block and Spring on an Inclined Plane model displays the numerical solution to this equation and shows how the forces change as the mass slides. The scale of the force vectors is arbitrary and that the image is rescaled as the incline plane length is varied from 0.1 to 10 m or the incline angle is changed. Users can set the coefficients of friction and the spring constant. The model plots the position, velocity, and net force on the mass as a function of time as the system evolves. "Damped oscillations and equilibrium of a mass-spring system subjected to sliding friction forces: integrating experimental and theoretical analysis," P. Onorato, D. Mascoli, and A. DeAmbrosis, American Journal of Physics, (in press). 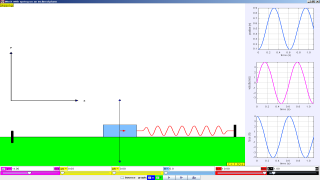 The Block and Spring on an Inclined Plane model was created by Wolfgang Christian using the Easy Java Simulations (EJS) version 4.3 authoring and modeling tool.